Zenta and Megumi Tanaka, the duo behind much loved Collingwood cafe Cibi, have a second little sister venue aptly named Mina-no-ie (which is Japanese for ‘everyone’s home’). Taking over a vacant warehouse Zenta further articulated the spaces lovely industrial bones with touches like blackened steel trestles that prop up recycled wine barrel boards reconfigured into beautifully textured tabletops. Running through the main spine of the cafe are two timber communal tables that are irreverently organic in their shape and soap-finished to provide their surface with a subtle off white hue. This subtle textural interplay also extends to the choice of handmade porcelain cups, saucers and plates created in collaboration between the Cibi team and local potter Shane Kent, a dynamic that recasts the everyday act of drinking coffee as a wonderfully tactile experience. These cups, along with other beautifully considered everyday products, will be on sale at Cibi’s select store. Megumi, the heart and soul of the space, has developed a concise menu offering the kind of heart-warming food that we have all come to enjoy at Cibi cafe. Harking back to the nourishing Japanese home-style food that she grew up with in rural Okayama, Megumi’s food philosophy at Mina-no-ie is as much about the notion of providing sustenance as it is about the balance of flavours. An ever-evolving food offering that relies on seasonality, organic produce and the environment that surrounds, the first menu consists of fresh, wholesome food. Coupled with the green tea cakes and great coffee, Mina-no-ie is the perfect space for respite. Mina-no-ie shares the space with curated men’s store Epatant. David Chang’s first restaurant Momofuku Noodle Bar, which recently relocated to 1st Avenue in the East Village, has become a kind of beacon to others in redefining a more casual and relaxed approach to food. Eschewing the overly finessed and fussy approach of his forebears, Chang remains committed to showcasing technique and ingredients in each dish though without the inherent pretentiousness and price tag. The space at Noodle Bar is dominated by a large blond timber communal table and counter where you can sit, eat and watch the chefs frantically go about their work in an open kitchen. The design is almost utilitarian in its simplicity and echoes the counter style ramen restaurants in Japan (where Chang trained for two years under master ramen chef Akio-san). Now run in partnership with Kevin Pemoulie, who coordinates the kitchen day to day, the service is sharp, perfunctory but still incredibly knowledgeable in its approach – an approach that served us well on the Monday night when we visited and experienced a forty minute wait for a table. Momofuku Noodle Bar’s menu is definitely focussed around a number of key dishes that have become a hallmark of Chang’s approach. Chang’s pork buns – a melange of mantou bun, delightfully tender pork belly slices, hoi sin, slithers of cucumber and spring onions – are a definite favourite amongst diners. The noodle dishes are also a stand out, as you would expect, with his signature Momofuku ramen delivering on its promise of hearty and smoky pork broth (made from smoky bacon and pork bones) combined with perfectly al dente egg noodles and delightfully lascivious 60 degree cooked egg garnished on top. Along with Ssäm Bar, Ko, Milk Bar and Má Pêche – Chang’s more upscale restaurant located in Midtown – there’s definitely a groundswell in acknowledgement that David Chang is at the vanguard of contemporary American food culture. Based in the town of Beacon one and a half hours outside of Manhattan, Dia have converted the old Nabisco printing factory – a bastion of America’s industrial past – to an expansive art space housing one of the world’s pre-eminent collectionof international and American art. Taking a train from the majestic Grand Central Station along the picturesque Hudson river you arrive at Beacon at once detached from the world around you and the cityscape that you’ve left behind. Entering the main hall of the converted factory through a small entry building, you immediately encounter a vast expanse of space, with converted exhibition rooms that run for metres on end. The space and light that abounds is at once beguiling and engaging for the spectator. Designed by artist Robert Irwin in collaboration with the design firm OpenOffice, the main exhibition rooms are filled with natural light streaming in from the industrial saw tooth windows that shape the ceiling. This intelligent use of the existing structure of the building not only provides the space with lovely lived-in industrial details but also pays homage to the building’s blue collar past. Richard Serra’s monumental metallic sculptures which envelope the space in a swirl of power and materiality were a highlight. Encountering these structures on a massive scale with their play of angles & height made our presence in the room feel decidedly miniscule. Combined with Sol Le Witt’s pencil wall studies of geometry and shapes, Dia:Beacon is a beautifully serene visual and spatial experience that is a must see for any visitor to New York. Often moments and objects of the everyday get overlooked in a world that focuses on the new. These are the moments that architect and designer Zenta Tanaka celebrates. His practice is one that is rooted in the idea of slowness and time, embracing and enhancing everything of your daily life – design for life. Zenta has worked on various projects with companies such as Birkenstock and Aesop as well as creating his own select shop and café – with his wife Megumi – called CIBI. We join for a discussion about his design influences and the projects that he is currently working on. Hi Zenta, thanks for your time. Can you tell me a little bit more about yourself? I am an open-minded, friendly father and whenever I go to day care to pick up my son, all the other kids surround me. I love entertaining and meeting people to get inspired! I love objects, furniture, toys, eclectic collections and dogs. I take inspiration from the world around me to do some creative design work – creating objects, space and special moments in life. So has architecture and design always played a part in your life? You studied architecture in Australia and Germany and subsequently practiced for a few years in Japan? Yes, a big part. Good design just makes you smile. It’s made my life more thoughtful and colourful, whether its clothes, furniture, objects, a notebook or a pen. I always take time to look at the things that surround me, taking moments to think and enjoy each object. I remember reading a little book on design by Shigeo Fukuda: a great Japanese graphic designer when I was little and it really opened my eyes and gave me a sense of being. Looking at the images and reading his thoughts about the role which design plays in life really resonated with me. Studying in Europe was also an eye-opener. A varied group of people studied architecture with me in Germany, people from all around Europe – people in different age groups. Their approach to learning, detail and the process of designing and building was profoundly thought through after continuous discussion. They always talked about design – it was inherently part of who they were. Can you tell me a little more about your approach to design? It feels to me that there is a focus on slowness, authenticity, the everyday and sentimental minute details? My approach to design is really about what I want to achieve, which is touching people’s feelings and everyday experiences. These are the moments that people can cherish for a long time and I endeavour to create objects and spaces that allow people to enjoy these experiences. This is essentially what I think of when I design and the notion that ultimately life through design makes it much more fun. Aesop, an amazing company and brand which I was a big fan of without knowing their total philosophy, concept and their thoughtful care towards customers. They embraced my approach to design and inspired myself to be a part of their retail experience. For example something that is done in an Aesop store is the simple gesture of washing hands thoughtfully, which I feel provides an added layer to the quality of life. Birkenstock has a profound heritage and philosophy in their products, they are showing me how to appreciate their fundamental message that product should be thoughtful and always of quality. They have been kind enough to give me an opportunity to cherish their products and showcase how beautiful they are in a flagship store which I am designing for them in Melbourne. 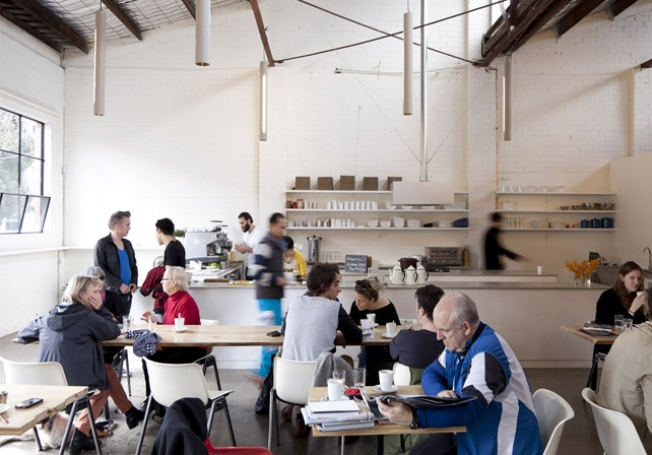 When you started CIBI in an old warehouse in Collingwood Melbourne before, was it always your intention to juxtapose a beautiful select shop with a café? Yes, our concept essentially revolves around life! Three elements: good design, a sense of style and food made with love are the elements that enable us live life to the fullest. We always wanted to showcase beautiful products designed by many great designers both contemporary and historical – for example Sori Yanagi whose products are timeless. This is the same sensibility that we wish for people to embrace in their life and their home. What do you love most about Melbourne – living and working in this city? Any favourite places that you visit week in week out? People – wonderful people who are inspiring that enjoy and appreciate what we do. We usually gravitate towards people that have a sense of balance. We also love to support our friends that we’ve made through food and the food industry – restaurants like Anada, Supermaxi, The Aylesbury and Marios are all great institutions (new and old) in Melbourne where people can linger and take pleasure from each other’s company. We really love spaces that feel like a second home. I also love many of Melbourne gardens in particular Edinburgh Gardens where I regularly have picnics and enjoy the sunshine. If I have any remaining spare time, I scour Melbourne’s various vintage warehouses and junkyards searching for anything from timber, old taps and metalwork. Melbourne has long yearned for a menswear store that successfully curates a selection of product that focuses on provenance that can easily form part of your everyday. Due to an embedded post war European influence, Melbourne’s menswear approach has generally focused on tailoring, muted and dark tones and subtle fabrics. Up There store – opened in 2010 by the collective of Brendan Mitchell, James Barrett and Jason Paparoulas – eschews this tradition, instead embarking on a search for a new kind of masculine identity that combines a sense of playfulness, a nod to the outdoors with inherent design detail. Situated on the first floor of a beautiful low rise building on Mckillop St Melbourne, Up There has transformed a small largely disused space into a premium menswear showroom. Utilising the lovely natural light afforded to the space by the industrial full height windows, the collective have curated labels like Sunny Sports, Norse Projects, Yuketen and Note to Self to fill their garment racks. Recently also picking up Japanese label The Superior Labor – who produce high quality cotton and denim wears in Okayama Japan – it is evident that the inherent quality of a garment is celebrated at this store. Extending this fastidiousness to the other products that are ranged, Up There are also one of the few retailers to stock Inventory Magazine and accessories from Bedwin. Likewise, the footwear on the display tables also juxtaposes the contemporary with the classic with limited edition Adidas and New Balance sneakers sitting side by side with a select range of Clarks Originals. It’s a store that deserves some recognition purely for its unbending search for something new. Situated in a back street in Collingwood Melbourne, CIBI breaks down established boundaries between food, retail and creative space. Opened in 2008 by husband and wife team Zenta and Megumi Tanaka, CIBI is one part select store and one part café. A deftly curated selection of design classics like cutlery and cookware by Sori Yanagi, Hakusan porcelain and contemporary collaborations such as the SIWA range of paper products designed by Naoto Fukusawa sit beside a café that focuses on providing locals much needed sustenance. Zenta Tanaka – with his background in architecture and design – has designed a café and store that successfully articulates the kind of lived in, industrial and eclectic design aesthetic that references the tenets of the slow architectural movement. Reclaimed materials, industrial elements like steel and formwork blocks are littered throughout the space. Subtle details abound, marimekko prints linger amongst found vintage furniture and a vintage Apple Mac is used as a doorstop. Display tables are created out of asymmetric trestles designed by Zenta himself and timber that was sourced from disused timber yards. Complementing this approach to design, Megumi-san’s food philosophy is as much about celebrating fresh ingredients as it is about the juxtaposition of traditional Japanese home style food and contemporary western cuisines. There are several dishes that continue to resonate with the regulars. The Japanese breakfast, fragrant rice, shiozake, bean salad and tamago comes with a hearty homemade miso soup that epitomises the simple heartfelt approach to their food. This embedded sense of soul is also present in dishes like the refreshing soba noodle salad and bean, sourdough bread and avocado CIBI breakfast – everyday food elevated and enriched into something special. Located in Chelsea on 27th Street, Hotel Americano is the first hotel in New York by Mexican hoteliers Habita Group. Habita founders Carlos Couturier and Moises Micha have created a string of design hotels that epitomise a kind of relaxed Latin sophistication juxtaposed with heavily curated room offerings. Hotel Americano is no different, taking over a disused parking garage on 27th Street and a half block away from the amazing High Line urban space, its stainless steel façade shimmers, illuminating the street in an affront to the existing industrial landscape. Embedded in the gallery district of Manhattan, it is evident that Hotel Americano’s aesthetic successfully treads the fine line between design hotel and a warm inviting space that locals and guests can sink into and make their own. The exterior and room design is minimalist with Habita collaborating with architect Enrique Norten. However carefully considered room amenities and design details abound with Loden Dager denim bathrobes, Aesop bathroom amenities, timber tatami style base for the soft bedding, a polished industrial concrete floor and a wonderfully useful in-room iPad surrounds the guest in a space that juxtaposes sleek European design with pared back Japanese restraint. On the ground floor, restaurant Americano (run by chef Olivier Reginensi, who previously worked at Daniel) serves lovely French inspired food with some Latin flair. There’s also a rooftop swimming pool – with inspiring views of the Empire State building – that doubles as a hot tub in winter. This combination of epicurean refinement and ability to soak in the urban landscape in an entirely personal manner makes Hotel Americano the perfect chic hotel for your New York odyssey.